New Item - Just Received! 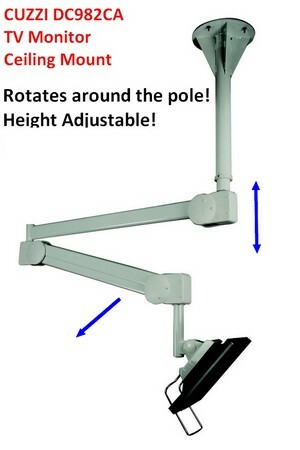 This hospital monitor ceiling mount & arm is height adjustable via a built in gas spring. You also choose the "drop" (length) of the first section of the mount (see video clip below). This height adjustable ceiling monitor arm also rotates around the vertical pole which is attached to the ceiling. Its swiveling and height adjustability allows the monitor to face in all directions. Since the section of the arm that attached to the pole is height adjustable, you can move it out of the way when not in use, optimizing personnel circulation in tight spots. This is great solution in situations where a monitor is needed but a wall in not available or when attaching to a wall is not practical or would complicate the working area.. Ideal for hospital rooms and other healthcare facilities, assisted living facilities, dental offices and homes.